The headquarters of the council was in Craigavon, on the shores of Lough Neagh, a new town built between Lurgan and Portadown. The council area included the large towns of Lurgan and Portadown, as well as smaller ones including Waringstown and Donaghcloney. The average council budget of £15.5 million provided a wide range of services to the 93,023 people living in the area. The council area consisted of four electoral areas – Central, Loughside, Lurgan and Portadown – in which 26 councillors were elected every four years. The council held an annual meeting in June, at which a new Mayor and Deputy Mayor were elected. Parties elected in 2011, the last elections for the council, were Democratic Unionist Party (DUP) nine seats, Sinn Féin eight, Ulster Unionist Party (UUP) six, Social Democratic and Labour Party (SDLP) four, and Alliance Party of Northern Ireland one. The last election was due to take place in May 2009, but on 25 April 2008, Shaun Woodward, Secretary of State for Northern Ireland announced that the scheduled 2009 district council elections were to be postponed until the introduction of the eleven new councils in 2011. The proposed reforms were abandoned in 2010, and the Northern Ireland local elections, 2011 took place to fill the last body on the council befoe being dissolvedThe proposed reform took effect on 1 April 2015. Together with part of the district of Banbridge, it was part of the Upper Bann constituency for elections to the Westminster Parliament and Northern Ireland Assembly. Note: The Workers' Party were known as The Republican Clubs in 1977 and Workers Party Republican Clubs in 1981. Below is a list of members who made up the final sitting of the council before it was dissolved. 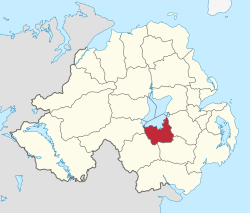 The area covered by Craigavon Borough Council has a population of 93,023 residents according to the 2011 Northern Ireland census. Craigavon Borough Council Facts for Kids. Kiddle Encyclopedia.